William Hill Bingo belongs to the hugely successful William Hill sports betting brand. The company are one of the world’s most popular bookmakers, and have been operating now for over 80 years. 1998 saw the arrival of its first online gaming site, and the company have since gone on to produce some of the best sports, casino, vegas and poker platforms to date! In 2007, they added bingo to the list, and the site has been growing strong ever since. 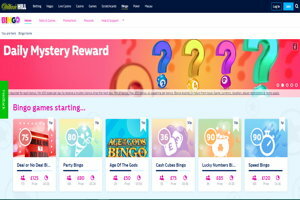 William Hill Bingo operates on the Playtech network, and is one of the most professional and high definition platforms around. The site itself is designed to perfection, with a stylish and sophisticated feel using the brands trademark blue hues. There is so much on offer at William Hill Bingo, so the lobby may seem overwhelming at first. Fear not however, because as soon as you start having a quick look around, it’s easy to see where everything is. When you register at the William Hill Bingo site, you are also given access to all of the other William Hill offerings too. These you’ll find clearly along the task bar at the top of the page, so there’s easy access to casino and sports. The bingo on offer here is so impressive, with a wide range of formats across a fun selection of rooms. Players can find classic 90-ball style games, along with more modern twists and pattern games too. You’ll find popular rooms based on Rainbow Riches and Deal or No Deal, as well as several unique William Hill rooms which are exclusive to the site. There are also over 100 additional side games available too including slots, scratch cards, casino and number games. There’s an absolute abundance of promotions and rewards on offer here throughout the year too, and you can see why its players keep coming back for more. Even though the site belongs to a much larger brand, it still has a nice warm and welcoming feel. It’s charming and fun with a strong focus on community, so it’s trusted and known but still has that personal touch. The welcome bonus at William Hill is the perfect way to get up and running, and is a great way to really trial all the gaming on offer. Details can be found via the link at the top of the page, and terms and eligibility factors apply. All players must be aged 18 or over to register. There are so many other promotions available at William Hill, and these are updated daily, weekly, monthly and seasonally. There will often be promotions that match up with calender events such Christmas, Summertime and Halloween etc, plus bonuses based on popular TV shows or sports finals. Monthly specials include, Half Price Mondays, Value Night Thursdays, BOGOF Saturdays and the Wednesday Mid Week Roll On. There is also currently a £30,000 winners night available every Sunday too. Simply log online between 5pm and Midnight GMT, and be in with your share of winning a slice of £30K. William Hill Bingo focus a lot on social media and chat specials too.The friendly community chat moderators encourage you to get involved in the chat games, and have some fun playing for extra special treats. Facebook and Twitter hold hidden prizes too, so head on over for even more chances to win. There’s some really fun regular features such as the Pub Quiz and Movie Madness, and you can even win bonuses for the other William Hill platforms. William Hill Bingo belongs to WHG Ltd. The company is registered is Gibralter, and licensed by the Gambling Commission UK and the Gibralter Gambling Commissioner. The platform runs on the Playtech software. The bingo on offer at William Hill is excellent. There’s a fantastic variety of styles and rooms, with new games starting every few minutes. You will find plenty of variation on the classic 90-ball game and also games in 75 and 80-ball format too. There’s also lots of speed bingo and bingo specials, which offer something different to the regular game. There are popular rooms such as Rainbow Riches and Deal or No Deal which offer huge jackpots and prizes, but if you prefer a slightly more intimate game, then William Hill have their own exclusive rooms too. As William Hill are such an established online gaming brand, they have an amazing selection of additional side games to choose from. Not only can you venture into all of the William Hill gaming options such as sports and casino, but the bingo page also has its own section too. There are over 100 well known slots titles to spin away on including Britain’s Got Talent and Big Bounty, as well as the latest 5 reel and 20 line versions of the game. There are bonuses galore and the jackpots are high! WIlliam Hill also offer a huge assortment of arcade games, scratch cards and number games too. These include Bouncy Balls, Wintry Wonderland, Roulette, Blackjack and Hi/Lo too! Whether you’re after some high rolling vegas style casino or just a few spins on the slots, WIlliam Hill has it all. Please read all terms and wagering requirements upon registration, as details are always subject to change. Bingo wager is 2x bingo bonus. Casino wager is 20x games bonus. Willam Hill is an outstanding betting brand, and its bingo site does not let that down. The bingo is fantastic and the promotions and prizes are high value and ever changing. If you’re after a tusted name with excepetional gaming and a great community feel, then William Hill Bingo is well worth a try.